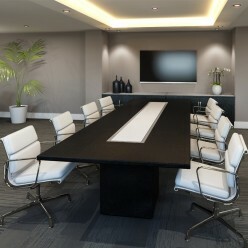 Square-Base range of boardroom tables finished in a choice of 15 veneers, with 6 different top shapes. The Square-Base range of executive conference tables can be finished in a choice of 15 veneers, with 6 different top shapes. Price on Application, call 0131 554 7564 to order and customise top shape and size as well as cable management.